Ganesh Chaturthi celebrations are incomplete without Lord Ganpati’s favourite sweetmeat, the modak. 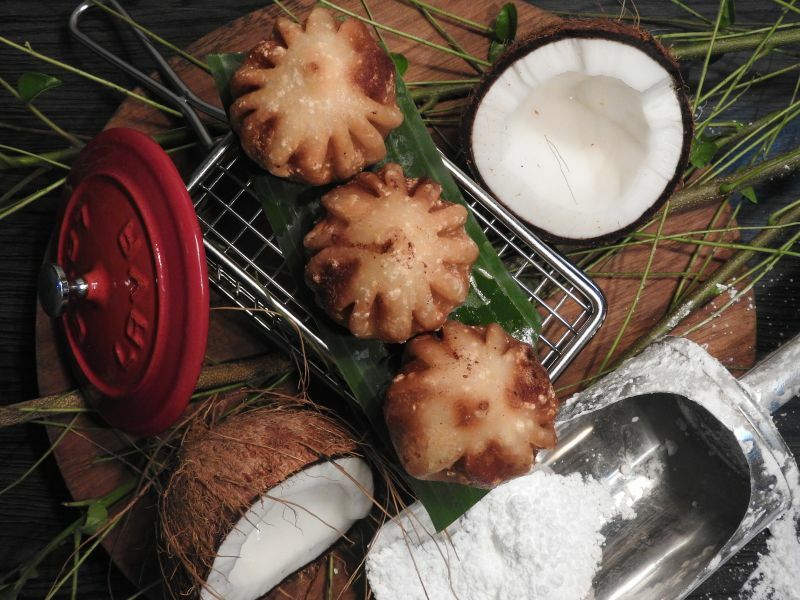 Modaks are Indian dumplings and are a special treat to the elephant-headed God and his devotees. Celebrated extensively across Maharashtra, Andhra Pradesh, Tamil Nadu, Goa and other parts of India, the 10-day long festivities is commemorated as Ganesh’s birth anniversary. The festival sees devotees offering the deity various sweets and savouries amongst which modaks make for the most prominent prasad of the festival. Modaks are steamed or fried dumplings made from rice flour, wheat flour, and have fillings including grated coconut and jaggery. Modaks are generally offered to the idol and then served as Prasad to the devotees. Steamed modaks are also known as Ukadiche Modak and are slathered with hot ghee before savouring it. According to legend, Shiva and Goddess Parvati were once graced by the demi-gods and presented with a unique, divine modak. The modak was up a notch since it had the ability to bestow the person eating it with incredible knowledge of science, scriptures, art, and writing. Goddess Parvati was thus keen on her sons having this modak. However, neither of them was keen on sharing this rare savoury, due to which their mother decided to test her sons. She wanted to know as to what sincerity and devotion means to each of them. Eager to relish the modak, Lord Kartik, within no time, went on a detour to explore the many spiritual places. Lord Ganesha’s strong sincerity and devotion towards his parents made him take a rather different route. He went around Lord Shiva and Goddess Parvati to showcase his unconditional love and put forth his point of view. Hence, our much-loved Lord Ganesha won their hearts and the coveted modak! Another story from the volatile books of mythology is that of Lord Shiva and Goddess Parvati along with Ganesha visiting Anusuya, the wife of a respectable sage named Atri. 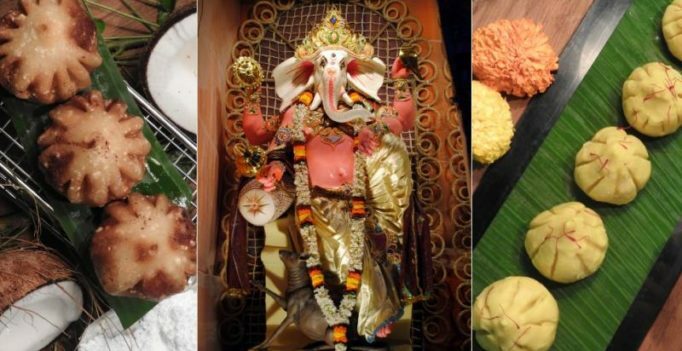 While Lord Ganesha was presented with a platter full of mouth-watering delicacies, none were able to satiate his hunger. The only food item to have done the impossible was our now-famous modak. 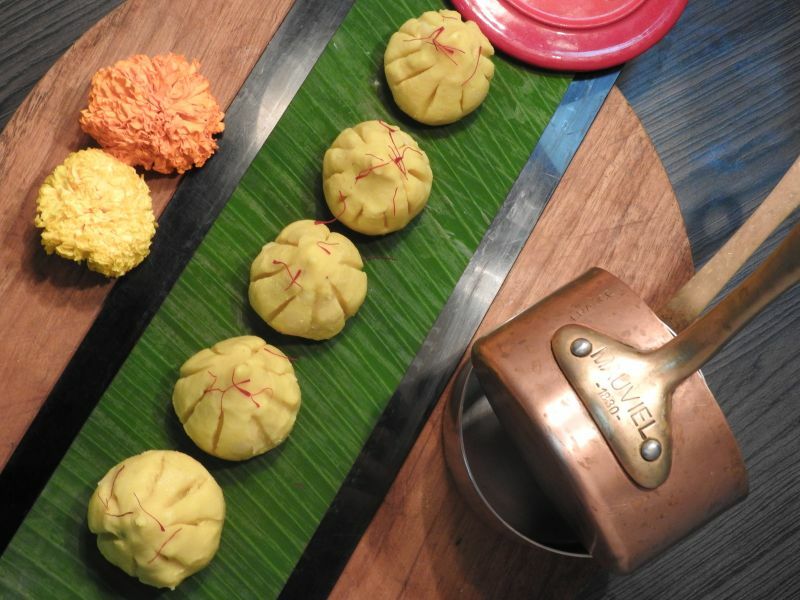 Hence began modak’s association with the Lord of obstacles and festive celebrations! Boil 2/3 cup of water, add pinch of salt and tsp of ghee and pour rice flour and mix well. Roast the poppy seed on tawa. Mix Jaggery and coconut and poppy seeds, mix it properly and cook for 2 minutes. Finally add cardamom powder and nuts. Take ukad, with the wet hand knead the dough to soft consistency. Split dough in equal size balls. Gather all plates at the center of stuffing and try to seal edges. Heat the water in idly cooker, put one small round pot and keep the SS plate on top of the pot place the wet muslin cloth on top of plate place the modaks on top of muslin cloth keep the enough space between two modaks. Flatten the ball with you palms, roll the flatten ball with the rolling pin into 4 inch diameter circle. Keep the edges little thinner than the center part. The recipes have been shared by Executive Sous Chef, Vilas Dhankute, Grand Mercure Bangalore.